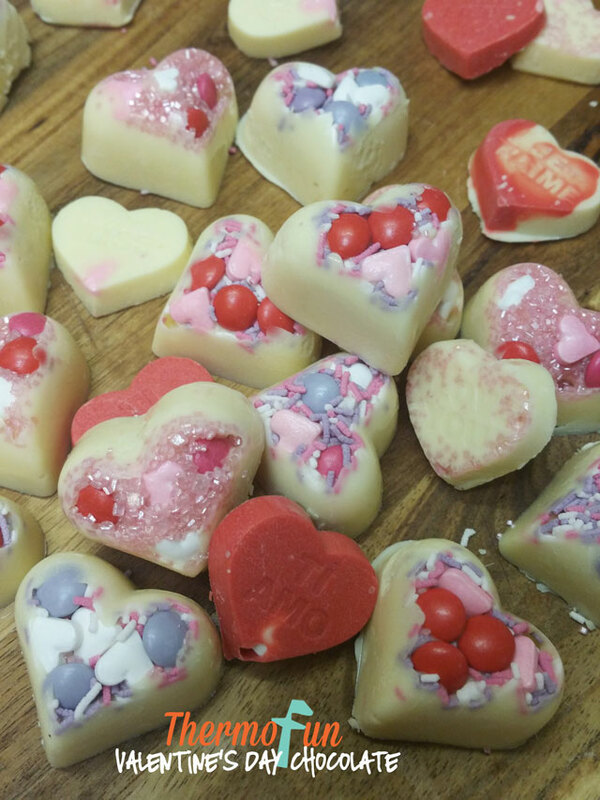 If you just want to share a few little chocolates with a loved one then why not whip some of these thermomix Valentine’s Day Chocolates up. All you need is some good quality chocolate, some molds and whatever you want to “top” your chocolate with. If you don’t have a mold, that’s okay – just make a bark similar to these (Chocolate Trail Mix Bark, Easter Bark) and freehand a love heart. For information on tempering chocolate Click Here. Place candies into molds covering the bottom of each mold. Place 150g of chocolate into TM bowl and grate 5 sec / speed 9. Scrape down and melt 4 mins / 50°C / speed 2. Half way through the 4 mins, remove lid of TM bowl and scrape down any chocolate from sides or any that is on top of blades. At the end of the 4 mins, add remaining 50g of chocolate to the melted chocolate and mix 1 min / speed 2 (no temp selected). Gently pour chocolate on top of candies in molds. Place molds into fridge to set.